Last week I spent Wednesday thru Saturday in Baltimore, Maryland attending EMS Today. 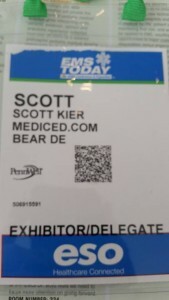 It was my tenth major EMS conference that I have been to since 2010. I am starting to feel like somewhat of a veteran. I have seen a lot of people come and go. I have seen good years, and I have seen bad years. In 2012, I barely made it out of Connecticut before Hurricane Sandy shut down the northeast. For the first two or three years, there was a certain buzz at the conferences. Twitter personalities and bloggers were everywhere. The podcast studio was a constant revolving door of people coming in and out to see who was there and who was going to be on during the next time slot. Classes were full of innovation. New speakers were sharing new ideas. Lines outside of certain doors were so long that you knew which classes were going to be standing room only. A big “thanks” goes out to the folks at MedicED.com for providing me with a free registration this year. In 2013, the conference world seemed to slow down a bit. JEMS decided to move EMS Today to Washington, DC. Some bloggers started families. Others just did not have the money or time to take off of work. Classes seemed to be the same thing that we had seen the year before. Sure, the huge push for Community Paramedical education had started but even that seemed to be starting to repeat itself. It was almost as if we were hitting an educational plateau. From a personal stand point, I had opportunities to take more classes thanks to winning a free registration from JEMS and the generosity of the team at MedicEd who provided me with free registrations in Nashville and Baltimore this year. Prior to this past week, while I felt like I was getting some knowledge out of class it seemed to be more of a reinforcement of what I had heard in previous years rather than some new innovation. The exhibit hall moved in the same direction. 2011 was filled with speculation of what ultrasound was going to do for prehospital care. There were new devices everywhere that you turned. Through the end of 2014 though, not much seemed to change. The atmosphere this past week in Baltimore was a little different. With the crew from Nightwatch ping-ponging back and forth between the Braun and Physio Control booths, and a clear focus on trauma medicine, there was a new energy in many of the exhibit spots. At the previous conference in Nashville there were a number of exhibitors who just looked bored. Their staff sat quietly in their booths some of them texting or having conversations among themselves. This time around though there was more of a buzz. There were new tourniquets around, and many different vendors selling bullet proof vests and carriers with large identifiable “EMS” logos on them. Most of the bag companies in attendance were selling quick access fanny pack or leg pack style bags for use during tactical deployments. Classes content also had a new buzz to them. 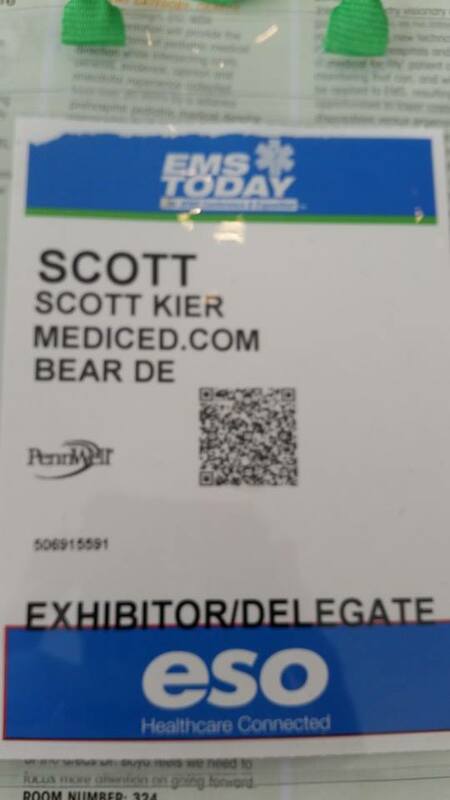 Maybe it was the conference being back in Baltimore, which is a lot more affordable of a city for EMS professionals, I contribute it mostly to the American Heart Association. With the changes in CPR and cardiac arrest care on the horizon and the innovation of pit crew CPR in many systems over the past two years, the people who attended the classes, while lower in numbers than I have seen in the past, were not just there to listen but they were there to interact as well. I saw more questions asked and points challenged this year than I ever have at a conference. Some of the knowledge shared was not all that surprising as intubation was downplayed, compressions prioritized, and epinephrine questioned, but people still wanted to speak their minds about it. All the time though, I could not help but think, “This ain’t how it used to be.” While there was buzz and excitement this time around, it was neither the type nor at the volume that it has been in the past. Don’t misconstrue what I am saying. I enjoyed Baltimore. I always find a way to walk away from these conferences feeling refreshed. I just hope that others did to. If there is any glimmer of hope that I saw, it was in the content of the classes. Quantity of attendees might have been down, but the quality of the classes was up. Hopefully JEMS and EMS World continue to raise the bar on their conferences and we, as an industry, continue to reap the benefits of their collective push for education. I want first time attendees to feel the way that I did in Dallas in 2010. I want journeymen and veterans to feel a new level of passion when they look at the course schedule and are left at a crossroad asking themselves which class they should take in the next block because the selections are that good. Maybe we need to look outside of our boarders for inspiration. The Paramedics Australiasa International Conference scheduled for October has adapted the tagline of “Arrive curious, leave inspired.” The more that I think about it, the more that I realize that in order for me to truly enjoy a conference I need to have this mantra in my head when stepping off the plane or checking into my hotel. It takes a certain level of passion to seek out the potential education that one can get from the classes at EMS Today and EMS World Expo. But it also takes a certain level of passion to put on a high-quality conference. Passion needs to fill the halls of the convention center. It needs to be preached by every energized speaker to take the stage. Exhibitors need to bring their “A” game to each and every conference. They need to put their best and brightest sales people. I feel like Pennwell and JEMS started the ball moving in that direction this past week. My fingers are crossed that EMS World will continue to bring that energy to Las Vegas this September. It’s time for the industry to start climbing again. While this year might be a rebuilding year in regards to audience numbers I think it’s time to get off of this plateau that we have been on for the last two or three years. Let’s start moving up again. Let’s find the next great “thing” whatever it might be. Good review of the conference Scott. Hopefully the after conference videos recorded in the podcast studio will pump up the content we put together a little bit. We’ll be back with a wide variety of episodes at EMS World Expo in Vegas this September. Hope to see you there! I would love to have been there, but it’s just not affordable for me at this time. As a volunteer, rather than career, EMS provider, I have no one to even consider paying any part of my expenses, and I’m not bringing in money to cover it myself. I don’t have a solution, but it would be great to see the major conferences be more affordable for volunteers. If anything, we need the educational opportunities MORE, since not everyone is blessed with an agency that provides much in the way of training.